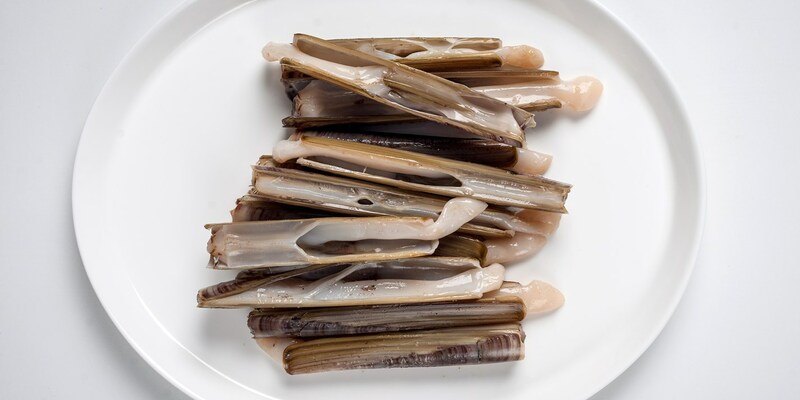 A popular, fast method of cooking razor clams is to place them under the grill - just make sure you keep an eye on the clams as they overcook quickly. Place the razor clams on a baking sheet under a preheated hot grill. Cook the razor clams until the shell opens, this will take only 1-2 minutes, so keep an eye on it. Instead of grilling the razor clam in step 2, Morgan Meunier chooses to add the razor clams to a preheated oven (180°C/gas mark 4) for a similar time until they have opened. Similarly, Nathan Outlaw prepares the clams by poaching in a flavoured stock until opened then continues from step 3.